The LOWEdown | The Official Blog of Casey Lowe. : I got me a Joe Murray book.. 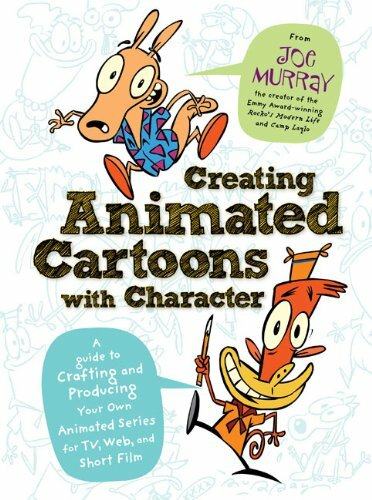 I got me a Joe Murray book..
For those who haven't caught on yet, this book was written (brilliantly, I feel) by the great Joe Murray, creator of the hit shows "Rocko's Modern Life" and "Camp Lazlo". I got my copy of this book the other day and was shocked at how thick it actually was! My immediate thought was that it would be filled with big pictures and sparse text; a pleasant surprise awaited me as I flipped through it. It's much more dense and thorough than I expected. The book is actually very well thought-out, entertaining, and informative. The pictures that are included (which are sized just right, not just filler) pertain to the text and are really quite inspiring. A bit on the content: Mr. Murray starts with a brief Bio that includes some great illustrations from earlier in his career, followed by a very brief animation history lesson. This is a great way to start the book, since you can't know where you're going if you don't know where you've been. He commences to plow forward by picking his brain about his own process in creating characters and stories, following them from initial kernel of an idea in your head to getting them on paper to creating personalities to pitching your idea, preparing a mini-bible for the pilot, producing the pilot, taking it to series, maintaining your sanity when this is your life day in and day out for years, etc. He does a fantastic job of illustrating the realities of the business while still infusing plenty of his creativity. His thorough commentary provides a step-by-step insight into what to expect (and prepare yourself for) in the creation of a television animation series. The icing on the cake? Mr. Murray also includes several interviews with other series creators and talents, picking their brains about their own process and insights on the industry.